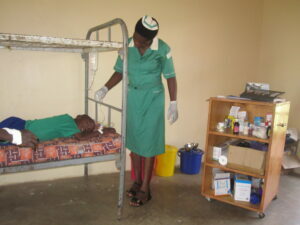 We are happy to today to tell you about our sick-bay/ clinic with a well trained nurse– Mbeiza Sarah Kasiba. She joined the organization in term 2 of 2017. The clinic has been a great relief to all in that the hustles of taking children to the hospital and running up to look for first aid has been dealt with. With the greatest ease, nurse Sarah helps the children by treating wound dressing, malaria, general treatment and referral in case of severe cases that can not be handled. Besides treating the children, the nurse also helps create awareness and sensitize the children on prope hygiene, sanitation and how to keep safe while in school. 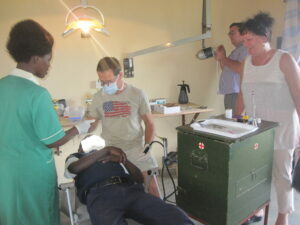 Every year, we are blessed to have dentist Pieter from Holland, a dental specialist who has opened up a modern dental clinic that has indeed helped a lot. He has also trained our School nurse to at least handle some minor dental issues. We are grateful to all those who have supported us to mak e this dream come true.